Instead of £1,159.00. You save £57.95 due to the online discount . 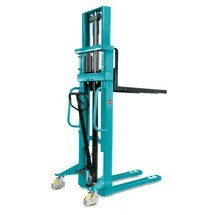 The Ameise® Quick Lift hydraulic stacker truck is a robust and durable product with reliable Ameise ® quality. The practical all-rounder for rapid deployment as a lifting and transport device saves you expensive forklift and maintenance costs. The quick lift function (up to 100 kg) allows you to lift the load clear of the ground with just three pumps of the tiller. Maximum lift height is reached after just 30 pump strokes, saving you both time and energy. 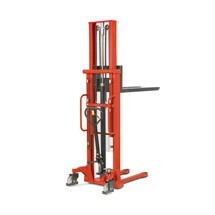 The robust, welded frame with central support and load forks made from torsion-resistant sectional steel ensures reliable dimensional stability of the hydraulic stacker truck, even when handling significant loads weighing up to 1000 kg. The steering castor is guided by an adjustable link chain, allowing you to move the load and manoeuvre the truck via the tiller with utmost ease. This also gives the truck a very small turning radius. The control lever for lifting and lowering the load is located on the ergonomic, rubberised tiller handle. 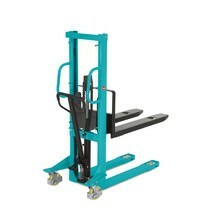 This allows you to transport and lower your loads in a straightforward, ergonomic manner. 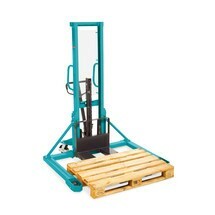 Fragile loads can be lowered gently and with precision control either using the tiller or via the foot pedal. 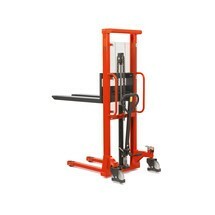 The hydraulic stacker truck also ensures maximum operator safety. The transparent Plexiglas panel within the steel frame offers protection against falling objects and provides a clear view in the direction of travel. The steering castors feature foot guards as standard and are also equipped with an easy to operate foot brake. This serves as optimum protection against foot injuries while also preventing the truck from rolling away. The two large steering castors and the single polyurethane fork rollers ensure smooth travel over uneven ground and on floors with high rolling resistance. 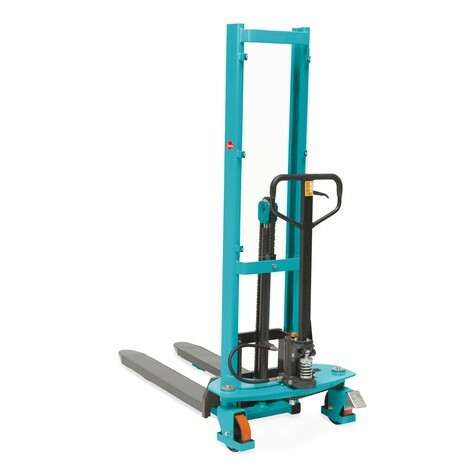 Thanks to its low height of 1965 mm, the hydraulic stacker truck fits through virtually every door, which enables flexible use in warehouses, dispatch areas and other environments. 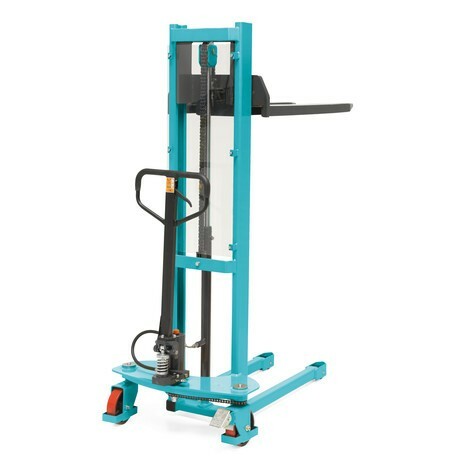 Benefit from tried-and-tested Ameise® quality by ordering the robust and agile Ameise® Quick Lift hydraulic stacker truck from our shop.